Sometimes it is very difficult to determine what is causing your ailments. You may feel fine, but experience bothersome symptoms like a sore throat. After looking up your symptoms online, there doesn’t seem to be a clear connection between something specific and your situation. People often get a random sore throat and cannot find out what is causing it so it’s understandable to suspect an allergy. So can allergies cause sore throat or is this a symptom that indicates an infection? Sore throat is a symptom that encompasses the pain or irritation in your throat. It might be difficult to swallow food or drinks and may be painful when you try to swallow nothing. Symptoms of a sore throat include dryness in the throat, swollen glands in the neck, white spots in the throat and a hoarse voice. People who are at a high risk for developing sore throats are children, smokers, people with allergies, and autoimmune patients. Many things can cause a sore throat. You may be suffering due to the physical irritation of the throat, inhalation of pollution, or a pathogenic infection. Common viruses like mononucleosis and influenza. Smoking can cause irritation and soreness. Acid reflux disease, which causes stomach acid to burn the esophagus. A yeast infection that may arise due to overuse of antibiotics. Dry indoor air, especially when the air is heated in a building. Low humidity can be rough on your throat. Breathing through your mouth may also contribute to a dry throat. Pollution inside and outside can irritate the throat. Tobacco smoke and use of chemical cleaners may damage your throat while breathing. Rarely, an abscess in the throat may cause a sore throat. This condition happens when the windpipe opening is blocked by an infected lump of tissue. How Can Allergies Cause Sore Throat? First of all, sore throat is not a direct symptom of allergies. However, post-nasal drip is, and a sore throat is a direct symptom of coughing. When your body is sensitised to its environment, you might experience allergic symptoms that describe your body trying to get rid of something. A bodily response to an allergen may lead to systemic inflammation and excess mucus production in the respiratory system as a result of histamine release. Coughing is very unhealthy and stressful to your respiratory system after doing it so many times. Due to repeated coughing, your airways will get irritated and inflamed. This leads to even more irritation and coughing. After a while, this will make your throat sore. Seasonal allergy symptoms generally include sneezing, watery and itchy eyes and congestion. If you are coughing hard with a fever and body aches, this is likely due to an infection. If your throat is itchy due to the weather or something that you ate, this can definitely be a symptom of allergies. This feeling may cause you to cough, which makes your throat sore if it persists. How long your sore throat will last will depend on what is causing it. If it is the result of persistent irritation like inhaling particles from smoke or other pollutants, your sore throat will last for about as long as you are exposure it to these things. However, if your sore throat is caused by an infection, it could last for about a week. If a sore throat is bothering you, there is no need to seek out a prescription drug or even an OTC medication to find soothing relief. There are very effective natural remedies that will work for you. Water. Liquids are always your best bet when trying to hydrate your body. If your throat is dry, it will make your throat even sorer. The first step to healing always involves hydration. Salt water gargle. This remedy will help reduce swelling of the throat tissue. It will also kill bacteria that may be present in your throat. Simply mix a teaspoon of water in a cup of warm water and gargle for 30 seconds. Honey. This yummy sweetener can help fight infection while providing pain relief. When combined in warm water, it can provide soothing relief to your throat. I make sure that all my cough drops incorporate honey as an ingredient. Ginger tea. This wonderful spiced tea is an antibacterial and anti-inflammatory that can relieve throat pain. It’s always best to boil your own fresh ginger. The tea can be sweetened with lemon or honey for more effective relief. A sore throat is one of the many symptoms that I get from seasonal allergies and food allergies. I have tried many changes to my health to help heal my allergies, but nothing seemed to work. Then, I had discovered that allergies may be caused by sulfur deficiency. This was definitely my case because after taking this organic sulfur supplement for a few weeks, my allergies had subsided tremendously. I never figured that I was deficient in a particular mineral like this. Sulfur is very important for your immune system and deficiency can be extremely common because its levels in our fertile soils are very low. Farmers do not allow the soil to turn over naturally because they reuse it so quickly and often. This makes total sense to me as to why a mineral deficiency was causing my allergy symptoms like sore throat. I want to spread awareness about how healing this simple nutrient deficiency did wonders for my health. Can Allergies Cause Sore Throat? The answer is no, sore throat is not a direct symptom of allergies. However, it is a direct symptom of post-nasal drip, which can be caused by allergies. In some cases, post-nasal drip caused by allergies will result in persistent cough that may make your throat sore. When mucous drips down from your sinuses into your throat, this tickling feeling will cause you to cough. If your body gets used to the reflex of coughing, your throat may eventually get irritated enough to become a self-destructive cycle that makes your throat very sore. If sore throat is your biggest symptom, I wouldn’t consider an allergic reaction to be a suspect. Perhaps your lifestyle or an infection is causing your sore throat. You should ask your doctor either way just to be sure, especially if it is a bothersome issue for you. Whether you are coughing from an infection, allergies, or smoking, I’d always recommend that you gargle and swallow a cough syrup with natural ingredients to help soothe your throat and suppress an addictive cough. The irritation caused by coughing will result in even more coughing that can damage your throat and lungs. 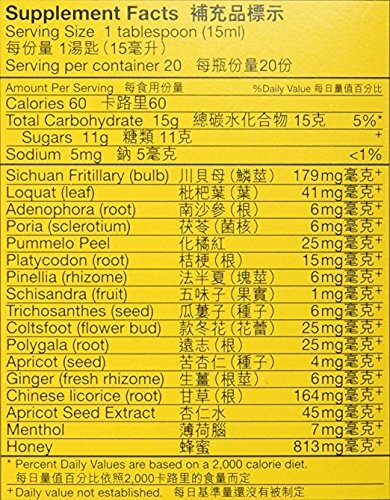 This syrup has all the ingredients that natural Chinese medicine offers your throat. It really works for me when I am coughing from allergies. A great cough suppressant and throat soother is Nin Jiom Pei Pa Koa sore throat syrup. Instead of buying these expensive ingredients separately and making your own mixture, I’d definitely prefer simply buying this syrup because it saves time and money. It works for my allergy sore throats, so I hope it helps you as well! I am always here for you, so if you have a question or something to add sore throats from allergies, leave me a comment! Up until now in my life, I’ve wondered what was up with my sore throat during the allergy seasons. I guess allergies don’t cause sore throats directly but it might be the physical coughing that just makes it worse. A sore throat is usually directly caused by an infection. For allergies sore throat can happen when you cough to get something out of your lungs and accidentally irritate your throat.